We've all heard of multi-level marketing (MLM) companies and pyramid schemes, promising you and your family financial freedom for eternity and your own island and your own yacht to get to the island and probably some girls in bikinis who live on the island. Maybe you've even known a few individuals that were enterprising enough to sign on to one of these programs. Liberty International, headed by CEO Randy Jeffers, is the parent company for many of these scams reputable companies, and today, I learned something extremely noteworthy about him that I felt I needed to share with you. We happen to know a few people who have gotten involved with Jeffers' new 'business opportunity', a company called WOW mobile that (of course) promises you free everything for life if you get people to sign up under you, causing distributors to alienate all their friends for free wireless service. We've been told that at meetings for these new distributors, Randy Jeffers is claiming to be the inventor of VoIP. NO, no, not Voice over Internet Protocol, the family of technologies that revolutionized wireless communications a few years ago. 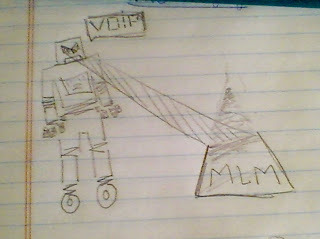 VOIP, the noise a robot makes as it turns its enemy into a pile of steaming ash with its powerful robot laser vision. You see, Stephen and I have done some extensive digging on the history of Voice over Internet Protocol, and can't find a single reference to Randy Jeffers or Liberty International! So, one can only assume that he must have had an important role in developing VOIP, the quintessential robot sound effect. I wonder what other robot sound effects Jeffers has pioneered? The man is a genius, and God bless him. :) I like your drawing.